These sweet and sour meatballs are great for dinner or as an appetizer for any get together. This is absolutely the easiest recipe for sweet and sour meatballs that you will find and my personal favorite. It comes from my friend Gail who made it for a pot-luck party I gave. Everyone loved them! The ingredients sound odd but baked together with the meatballs it is fabulous. Give this one a try the next time you are looking for an easy party recipe. Combine the chili sauce and grape jelly in a saucepan and melt. Add the meatballs and simmer for 1/2 hour with the lid on and then 1/2 hour with the lid off. Note: I find that if I cook the meatballs longer with the lid off, the sauce becomes thick and sticky, great for a party appetizer recipe. These tasty grape jelly meatballs can be made the day ahead and reheated when you need them. The meatballs are really easy to make. However, using the small pre made frozen meatballs makes life even easier! Protein foods at their easiest. 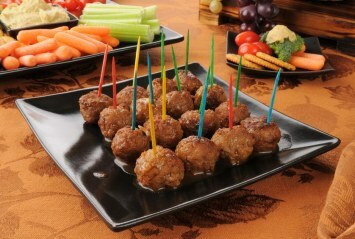 These meatballs are great on a buffet table too, or as part of an easy pot luck dinner. The jelly and chili sauce recipe says that you can use cocktail sausages too, or cut up wieners. I prefer just the meatballs, but try it with both if you prefer. Crockpot variation – This recipe can be cooked in a crockpot. The meatballs should be browned first to prevent them from clumping together. Then put them in the crockpot with the sauce for about 5 or 6 hours on low. These sweet and sour meatballs are easy party fare. For more great appetizer recipes, click here. These sound fabulous Kim. I think I will try them. And I love the idea of using sugar free jam. Thanks.